Home » Cursed by Cursive? 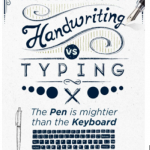 But test scores aren’t the only reason that handwriting is back in style. More and more classes are using keyboards for virtually all school writing. But current brain research tells us that writing by hand develops neural circuits that support learning to read, leads to more comprehension and retention than word-processing, and has even been shown to unleash creativity and promote positive thinking! 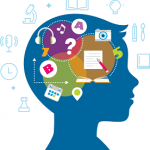 Read more in “5 Brain-Based Reasons to Teach Handwriting in School” by spelling expert Richard Gentry. The jury’s still out over the benefits of cursive writing over manuscript (“printing”), but experts agree that it’s important for every student to be able to produce some form of legible and efficient handwriting. As noted above, messy handwriting can seriously impede academic performance or test grades for students in middle and senior grades. It’s pretty hard to fix bad handwriting habits once students are in middle school. Occupational therapist and blogger, Miss Jaime, suggests giving students narrow-ruled paper and skip lines in between. She has found that writers take more care with smaller spaces. She also recommends special “spacing paper” (RediSpace Transitional Paper by Mead) that guides writers in spacing letters and sticking to the margins. Moveable sticky arrows also guide writers in defining spaces between words. Have students take notes by hand, when listening, viewing or gathering information from another source. When doing high-frequency word work or other vocabulary or word-level studies, focus on letter formation and quality penmanship. Have students complete graphic organizers by hand. Handwriting slows readers down and forces them to synthesize and carefully choose the words they use. And in case you’re still not convinced, it might surprise you to know that some doctors are actually prescribing handwriting to aging Baby Boomers to ward off dementia!